Stephen Colbert isn’t the only non-musician interrogator who can get Jack White out of his comfort zone. Recently Interview magazine facilitated a conversation between the chart-topping Blunderbusser and one of his idols, second-man-on-the-moon Buzz Aldrin. The exchange that ensued between the two recently divorced celebrities harbored its fair share of awkwardness, brought about mainly by Aldrin having little to no interest in music beyond the Karen Carpenter era (he is, however, very interested in “gorgeous gals”). But it was also enlightening in unexpected ways. Here are five things we learned about White that probably couldn’t’ve been learned any other way. Jack White’s preoccupation with Carl Sagan is far from over. White’s got a bone to pick with the Guinness Book of World Records. Don’t call the Dead Weather, or the Raconteurs, or any other group project White does a “collaboration.” Except his work with Danger Mouse. That was a collaboration. He still asks himself why the White Stripes had to die. Though he does repeat the “I wouldn’t feel right going solo with the band still alive” answer. Errr, we’re gonna just hope he hasn’t seen where he fell on ours yet. He isn’t opposed to breaking and entering if there’s a nice car at stake. When Aldrin admits his red Mercedes is “in the condominium that [his] ex-wife is in now,” White offers: “If you want me to help you sneak in there and repossess it, I’d be in for that.” But only because it fits into one of his color schemes, we have to bet. White is more obsessed with the moon than we thought. 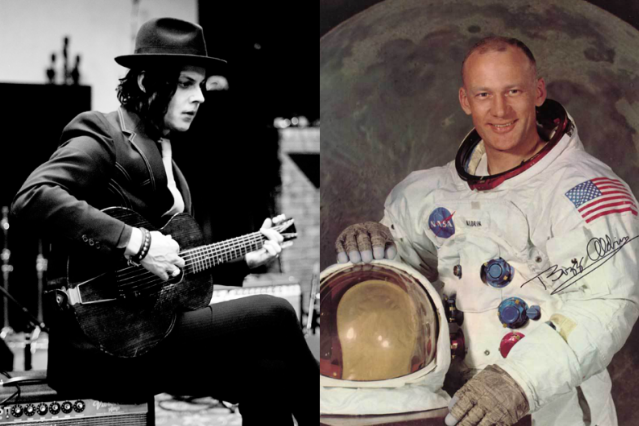 Buzz Aldrin admits he’d never even heard of Jack White before Interview called him about chatting with the musician. (He will have you know, however, that he knows a whole bunch of other people almost named Jack White, which is almost as good, right?) But White himself certainly knows all about Aldrin and the 1969 moon landing, asking (quite unscientific) questions about the mission and the moon’s surface (“What did the moon feel like to you? Did it feel like it was alive?”) and confessing that one of the songs on Blunderbuss is about the moon. We still aren’t sure which one that moon song actually is, so if you have an idea, let us know!